A strong, full-bodied black tea from the regions of Ceylon and Assam expertly blended with a hearty flavor and delightful aroma. The Irish really love their tea and are amongst the most frequent drinkers of tea around the world. 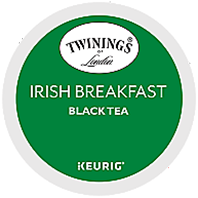 In celebration of this tea drinking tradition, Twinings blended a special Irish Breakfast Blend. This tea is best taken with milk and sweetened to taste to bring out the best flavor.